Here's another one that got a bit overlooked because of the fact that it was thrown in with Stories of the West Loop, which got a bit overlooked at the time. At least the comments were relatively good at the time. The name "College Station Business Center" invokes something grandiose, like a small cluster of mid-1990s office buildings, but it's not. In reality, CSBC is just a strip mall with some unimpressive tenants, and according to LoopNet, built in 1984 (which may or may not be true, since LoopNet is often wildly inaccurate at these types of things). The other major tenant, roughly in the middle of the plaza, was Acrofit Gymnastics, a gym for kids and teenagers. I think it closed 2004, about the time an "AcrofitGymnastics.com" launched. I have no idea if they're related, with the only clues being that Acrofit had another location in Houston, the other location is in Kemah (a suburb of League City, which is a suburb of Houston). I also have some vague collection of "Tumble Tots", which the other site does have. Acrofit was a trashy place: it was large and cavernous, although it had moved some equipment around, there was a small viewing area (and an upper level, which they closed off). There were high ceilings, gymnastics equipment, chalk, a trampoline suspended over a six-foot concrete pit(! ), running mats, no adequate air conditioning (just lots of fans). There were some rather dubious-looking paintings of children's cartoon characters (including Barney). They also had the "AcroBus", which had been seen in town post-closure. I did go to it at one time in the distant past, but I can only remember the smell (like feet), those scary-looking ropes, the basic layout, the mysterious upper level, those cheap seats they had for viewing, and a few framed pictures of Olympic gymnasts. Over all, it was a filthy place: I have no idea how old it was, but here's some 1996 forum postings regarding it. 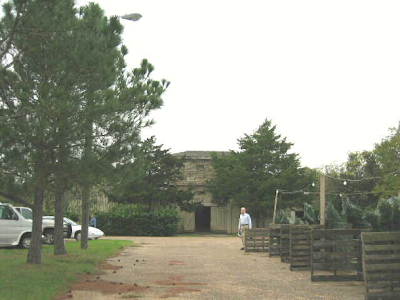 There used to be a location of Jacob's Well right next to it, which has purified water. Jugs of it, and when I was there as a much younger person, wished I could get a drink of delicious filtered water, while being tired out from the various run-and-jump-at-the-springboard. After Acrofit closed, it was replaced by Action Printing and something else, though Action Printing closed later (2008? 2009?). There was 2818 Grooming at the end, which I recall the temporary sign being far better than the permanent one (an ugly backlit white-on-red sign, rectangular), Thunder Computers (which, despite the presence of a website, is no longer around), and a few other forgettable stores. 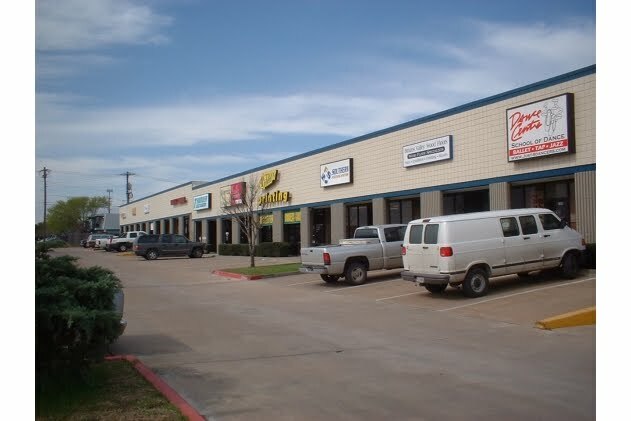 As you might've guessed, with a name like "College Station Business Center", it consists of mostly service-oriented tenants, not exactly shopping (which is probably why Paint N More, Franklin Candle Co., and Dollar General couldn't hack it). I took a few pictures from my cellphone from odd angles (hey, the car was moving), and there's this picture from LoopNet (toward the bottom), which shows Action Printing. The suite numbers are below (still working on this part). Ste. 101 - For years, this was a small hardware store called Paint N More, at least that's what it was in the 1990s. It closed circa 2000, then it became Franklin Candle Company a few years later (2004-ish), and then Dollar General after that before it closed. And yes, I realize that while there WAS a Dollar General at the old Kmart building, it opened a few years after the other one closed, maybe occupying it from 2005 to 2009. 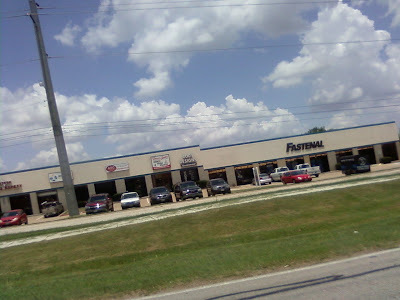 It later became Fastenal, which closed in June 2017 when it consolidated with the Bryan location. Ste. 107 - Southern Fastening Systems until early 2017 when it became SouthernCarlson (merger). There's a few warehouse areas behind it like an iPhone repair place invisible from all angles unless you were heading southbound on Longmire. Some of these include Doggone Maintenance & Cleaning Services, Aggieland Computer Repair, and What's the Buzz Coffee Company (free samples, apparently). There was also a wholesaler's business back there. I took a few pictures of the area, but they're not very good. The former restaurant today. Notice the cedar trees, and the Kettle sign. The large "Manor House" sign was above that. This article used to be one of the poorly-written ones, as it originated from an outdated version of the Kroger shopping center across from Southwest Parkway. 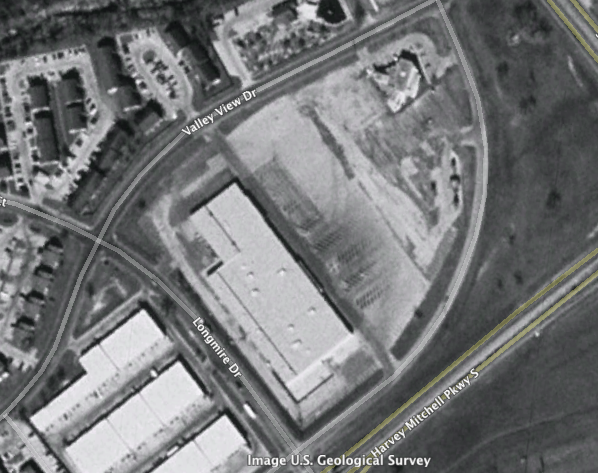 Today, it's only a nail salon, but an aerial shows that this building predated the entire shopping center across the street as well as many other buildings along that stretch. It was built in the late 1970s (with the 1980 phone book having it), as Pelican's Wharf, an upscale-leaning steak-and-seafood eatery not unlike a nicer chain restaurant (but still cheap enough so that college students could afford to eat there). Another detail I picked up from TexAgs, was that although it was waitservice, there was no set waiter/waitress assigned to a table and they shared their tips. 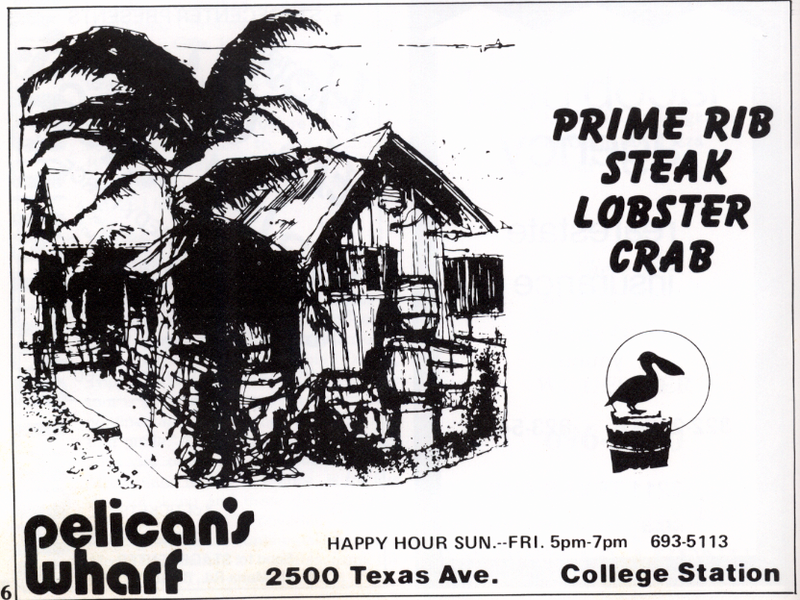 For a restaurant, Pelican's Wharf survived a fair number of years, up until the mid-1990s, when it closed (a 1993 phone book and 1995 city directory list it). Around 1996, Pasghetti's opened. According to a comment either here or at another part of the blog (see below for details), you could pick your pasta and sauce, and enjoy it (presumably with a drink and a breadstick) for around $4.95. Refills were a dollar. At the time I was writing about Pasghetti's, I could really connect to that, because one of my favorite places to eat at Texas A&M at the time was a place inside the Commons food court, where you could essentially get the same thing for about $6.50-$7 (though no refills). Later, it was a place called Pasghetti's, and one source I had said it was open "96ish", but I had another source that said it was in the earlier part of the 1990s. 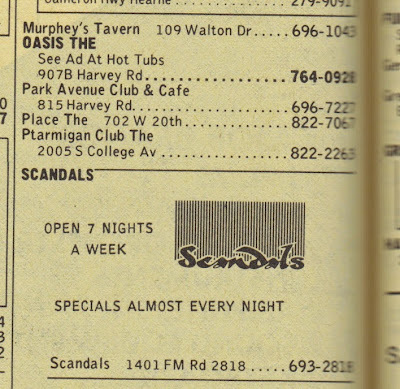 The "96" source seems to be the more correct one, as a 1995 city directory still listed Pelican's Wharf, and a 1996-1997 phone book had Pasghetti's here (though it listed as "Pasgetti's", which given they also listed Papa John's as "Pappa John's", I wouldn't take their spelling as gospel). If we adjust the dates, I would say that Pelican's Wharf closed and Pasghetti's opened in the 1994-1995 frame, with Royers' picking up the slack in late 1996 or early 1997. 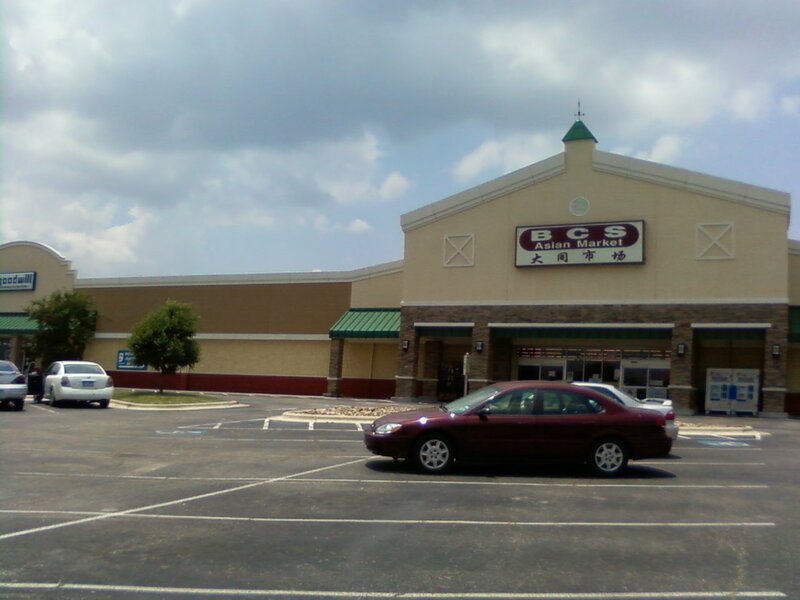 In 1997, "Royers' College Station Café" opened here. Often erroneously written and recorded as "Royder's", it was a spin-off of Royers' Round Top Cafe, an eatery with pies and unique menu offerings has gotten the attention of food TV shows and other sources of press for its food, décor, and the fact that Round Top, Texas is less than 100 people. 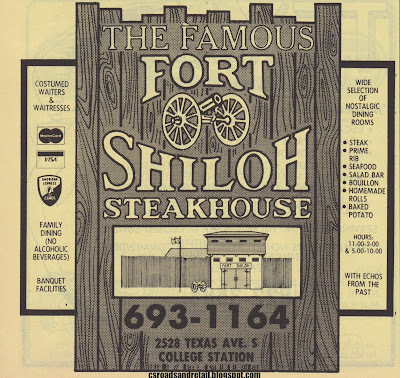 Of course, in a brief time in the late 1990s, you didn't have to go southwest of Brenham to eat here, as there was a sister store right here, in College Station. By 1999, it was gone and it remained that way for several years before NailSpa moved in, which I think was maybe circa 2003-2004. I don't think I missed any businesses here. 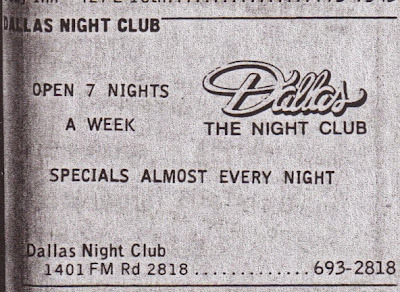 I know I strung this together from several posts, including Tales of Defunct Restaurants. 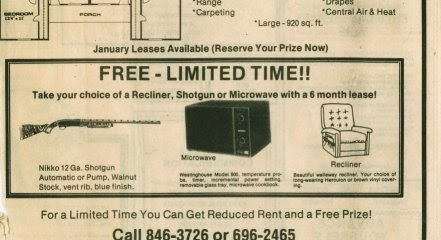 Information from Pasghetti's derived from MyBCS.com and a comment on this post, which corrected the date (this was later confirmed by old phone books). There's also a mention of this restaurant in an ad posted over at the Manor East Mall. I think that NailSpa is a waste for this restaurant building. I sure would like to see a restaurant here again, but in all reality if NailSpa leaves, the building will probably be demolished. UPDATE 4 (September 2015): full rewrite, incorporating a few elements from the old version. Southwest Crossing was built in the mid-2000s, I believe it was late 2005 or early 2006 when it was completed. On paper, the center sounds great, partly because there's so much food to be had there: chicken fingers, kolaches, pizza, barbecue. But it's really a small place, and it's surprising it even has a name. 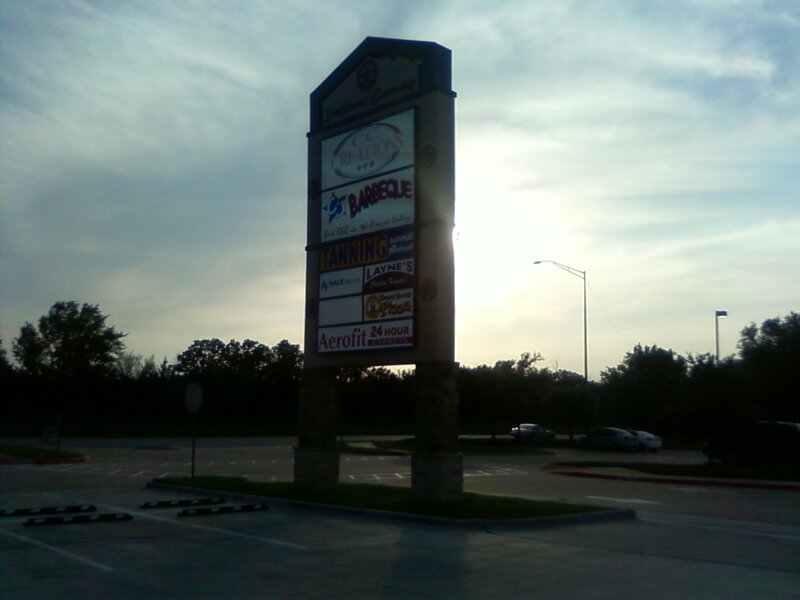 It was evening when I took this, so the main sign's angle is bad, but others aren't. Tenant turnover is surprisingly low (well, given the thing has been here for about a decade), so here's what we got so far, starting from the side closest toward the university (from the left, should you be looking at it head on). - C.C. Creations (1311 Wellborn) was first big tenant to open, moving from their warehouse center on Holleman. Interestingly, in 2013, they moved out, consolidating with the Trophies location (Harvey Mitchell Pkwy. and Southwood) into the former Red Oak Sportswear building (very close to where they were before). Later on, this became a fly-by-night tutoring operation (one-on-one, not a group "here's how to pass the tests" type) called Aggieland Tutoring but I think that's gone too. 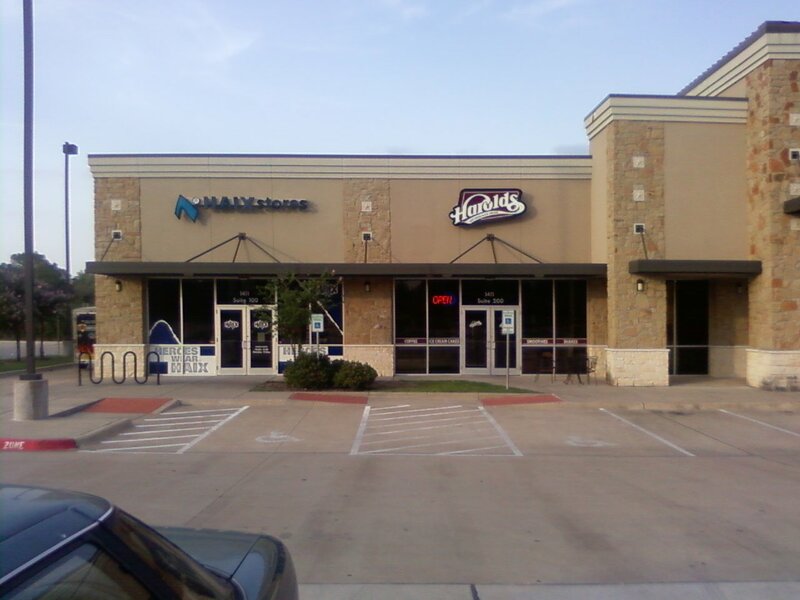 - Layne's of College Station (1301 Wellborn) opened a bit later (before December 2006). This Layne's is modern, unlike the hole-in-the-wall in Eastgate. 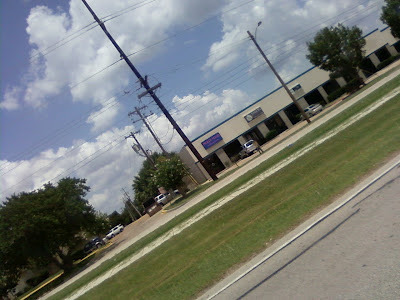 - Haix Stores (1411 Wellborn Ste. 100) has been here for years, but I don't remember anything before it. - New York Subs (1411 Wellborn Ste. 200) was replaced with the suspiciously similar Sub Culture. But Sub Culture couldn't last and in early 2012 it became Harold's Hot Dogs & Ice Cream, a local outfit serving hot dogs and ice cream. Harold's closed in June 2014, which was a bit of a bummer because, in essence, it was Maggie Moo's from the Rock Prairie Kroger center, and with the passing of Harold's went a number of unique things, including their oatmeal cookie ice cream. In spring 2015, it reopened as another Kolache Rolf's location. 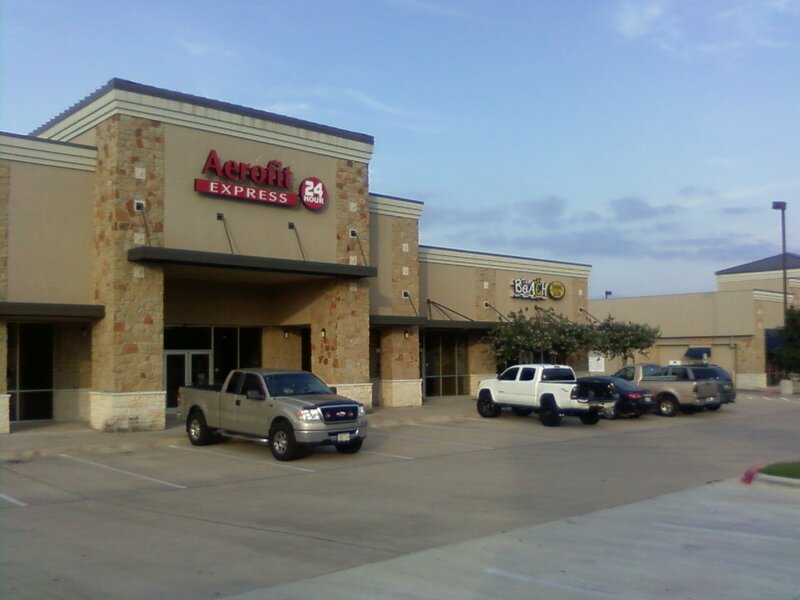 - Aerofit Express (1411 Wellborn Ste. 300) was an Anytime Fitness franchise before, and for the longest time the leasing office for the Woodlands of College Station. 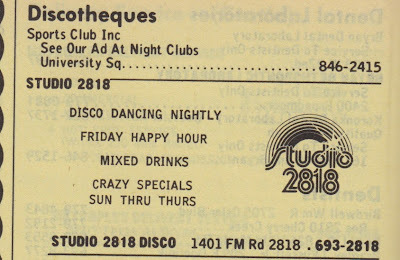 Before THAT, it was a college bookstore that was forgettable and closed within a few months. Unfortunately, I can't remember the name of it. - The Beach Tanning Salon (1411 Wellborn Ste. 400) was one of the originals, though I'm trying to think if it's still there or not (did it close in summer 2014?). - C&J Barbecue opened here fairly early on. I used to love their mashed potatoes, full of melty cheese, bacon, and topped with parsley. At some point in the past, they switched to processed cheese (like, as in, Velveeta), but I think they changed back (though it was pricey). Later on, we stopped going due to the high price of beef. - Hungry Howie's Pizza opened its first College Station-Bryan location here. This opened circa 2006, and is the only HH's Pizza in the county (it's more popular in areas like Florida and Michigan). They made some news in the sports universe when they had a Heisman trophy pizza. The last building is 105 Southwest Parkway, and both have that address. EDIT 10/8/12: C.C. 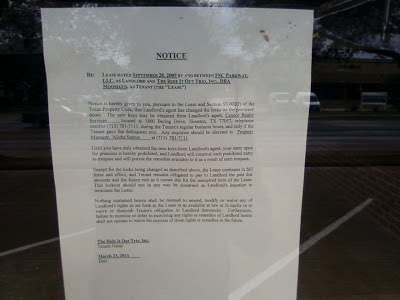 Creations moved, consolidating the Trophies location (on Harvey Mitchell), closing this location and moving back to close where they were--on Holleman. Notably, not where they were before exactly--they moved to the old Red Oak Sportswear, which closed circa 2008. EDIT 7/9/14: Updated post to account for closure of C.C. Creations and Harold's. Took out more negativity. Rewrote other parts. I think the Beach may have closed. 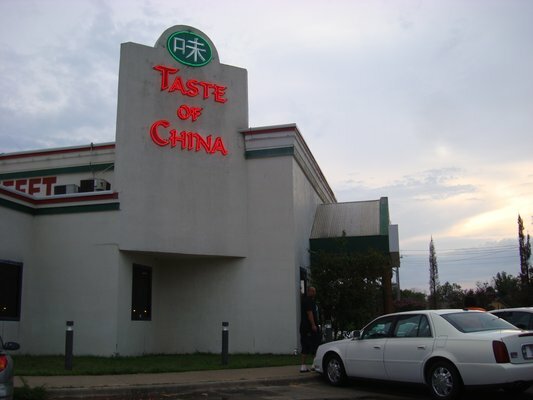 Built as a gourmet foods store, this building later served as the buffet Taste of China, which is what most remember it by. At some point, the building changed addresses from 1704 Valley View to 2702 Texas, but here are the various incarnations of the building. First alluded to a comment on this blog, Ira's was a two-level gourmet foods store that sold (among other things) wine, chocolate, and baked goods. You can see an early 1980s ad here if you'd like), built sometime in the mid to late 1970s. 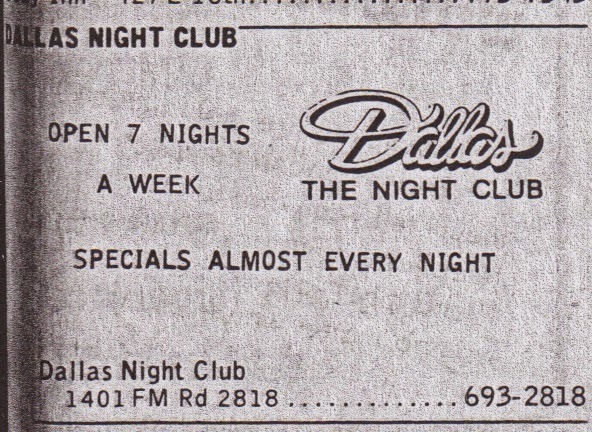 It's unknown to when Ira's went out of business exactly (sometime in the mid 1980s, likely during the oil crash). Owned by former hotelier Joe Ferreri after he lost nearly everything he had after the oil bust caused him to lose his beloved Ramada Inn. Probably the red, white, and green striping was added to the building at this point. I just don't have a lot of information on Ferreri's, though, nor do I know if it was any good or not (Olive Garden was just at Holleman and Texas at this point). In early 1997 it closed when he retired. After that it became the "Burton Creek Pub & Brewery". Discounting the fact that Burton Creek is in Bryan and the closest creek is Bee Creek (and Carter Creek Parkway is next to Burton Creek...don't ask), Burton Creek Pub didn't last too long, circa 1996 to 1998. The place sold cigars and homemade beer, with décor including a "walk-in humidor, leather sofas, [and] bear skin rugs". Somewhere I remember reading...it was either on MyBCS or the HAIF, that Taste of China, for years just hid the leftover brewing equipment and never used it. I don't know if they served real food otherwise, though. Finally, it became Taste of China, which was your average (forgettable) Chinese food place (though we picked up food a few times here before, but all I can remember is greasy noodles and such), though unfortunately, it's one of the "better" buffets (a very relative term), and that was in 2005 (I have no idea what it's like now nor am willing to find out). In summer 2014, it received a repaint (all yellow, but a different shade than the nearby AutoZone) and in spring 2015 closed with little fanfare. In 2016, it became Q Beauty Supply (without fanfare) and C2 Education Centers (suite 200). Updated July 2014 with new ad and some other stuff, then again in 2015 after it closed. In 2016 this post updated again, and I'll probably change the name and photo soon. Slight update in 2017 to account for formatting. 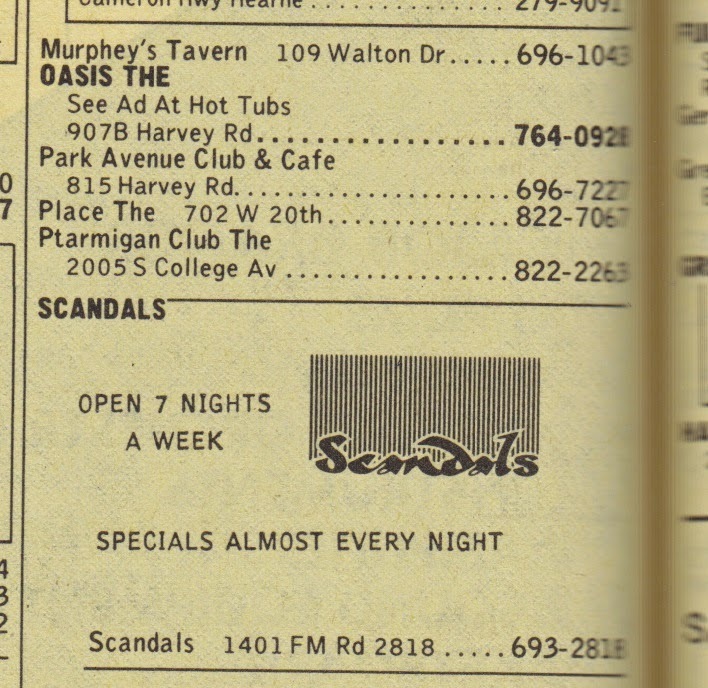 The first comment alludes to Tales of Defunct Restaurants III, which had the restaurants mentioned below. These can be found elsewhere on this site. We have talked about Kmart (which is gone). We talked about Walmart (which is still there). And now we get to Target. Well, the Target in College Station (T-800) opened in July 22, 1992 and has only been remodeled once, around 2005-2006 or whereabouts (I don't remember when). I do remember the old store, though I'm glad I had a few memory jogs since then (including a visit to a two-story yet unrenovated Target, a few pictures of a Target of that vintage, a visit to a Kmart, and this excellent blog post [contains language]). Well, unlike that link shared in Dumpy Strip Malls, which showed the interior of an early 1990s Target, this store looked different. There was still aluminum hand railings near the check-outs, a rather unimpressive in-store eatery, a store that smelled like popcorn (what's wrong with that? ), but the signage was colorful, with large signage directing you to different parts of the store, with arrows and red/blue/green/yellow signage on the departments and signage to them (a "department signage example" here, though it's an old one). In fact, the whole store had these red/green/blue/yellow neon strips around the store. You can see a glimpse of that at Southridge Mall, Des Moines, Iowa, which opened the same day as the College Station one and delightfully hadn't renovated yet, so you can see that from inside the storefront (Sadly, it has since been remodeled). You might also find better pictures if you do some Flickr digging, but that's on your own time. The store wasn't all that different from the one that's there now: the store was a different color on the outside (whiter) and the departments were arranged differently, with a different merchandise mix. I know the electronics were toward the front of the store, near where the pharmacy is (I remember that the Dreamcast games were closest to the front wall) and that the foods section (very different back then, mostly just chips, candy, and soda) was near the checkout stands. Regrettably, I can't remember much more than that (unlike the Wal-Mart, which only changed its departments more recently--plus I went to Wal-Mart a LOT more than Target). I remember the dressing rooms hadn't changed all that much (a bit nicer), the food area renovated, and the water fountains were finally cool (that's what bothered me about the old store: the water at the fountains was always warm). I remember the systems at the Customer Service desk advertising baby registry or Club Wedd...those didn't change too much (except for flat screens). The toy section was in the far right back section of the store. I don't know what it replaced, though I think it was some hardline goods that Target no longer carries (like gardening supplies or automotive--or they just shrunk the categories in everything else), and that's one of the reasons I don't like Target as a discount store, the small selection of hardlines, and the fact that the quality of some items aren't much better than Walmart's (take my advice, don't buy analog clocks at Target). Later on, Target did some more updates, like updating signage. One final memory: when I was younger, there was some little glass display that appeared around Christmastime, with some sort of thing that spun around to the bottom. It had lots of fake "snow" and I think it was some sort of mini-Christmas village. Anyone remember it, know what I'm talking about? No? The Kroger's facade was once dated but at least looked okay as compared to this disaster. This was one of the first posts on the blog, and has of course gone through numerous updates and rewrites (a rather extensive one in 2013 with updates in 2014). The post originally started out with a post back on the HAIF many years ago when I was young and relatively naïve. Parkway Square holds a good bit of nostalgia for me (of course) and all the things surrounding it, including the shopping center catty-corner to it, the hamburger place on the north side that was torn down for what it is now Drew's Car Wash (it was a Redline, but that wasn't the name it had before it closed--and I did discover a real Redline in Dallas recently that looks almost like I remembered it here), Fort Shiloh, the Days Inn, Manor House Inn, and the closed-down Royers' (note that none of the aforementioned posts were even thought of when this post was originally published). In 2016, the center was updated, giving the Kroger a repaint to make it look miles nicer after an unfortunate stucco disaster, as well as giving a new roadside sign, replacing its dated early 1980s signage with something that is bland but at least modern. This lasted a matter of months. Construction on Parkway Square seems to have taken a long time, it opened in 1982 (from what I've heard from DrFood, and confirmed by KBTX, but I also wonder if this is one of those "self-confirming things" where KBTX just "researched" it here) but construction was announced in 1979. Part of the problem must have the drainage, as the parking lot is built out of numerous concrete "squares" sitting on top of a drainage area. Growing up in the 1990s in College Station was a time when there was a wide variety of supermarkets, where there was an H-E-B Pantry, two Albertsons stores, a Kroger, an AppleTree, and prior to around 1997, a Winn-Dixie and a Randalls. Of course, none of that mattered if you only went to two. For me, those were the H-E-B Pantry at Holleman and Texas Avenue (now a DSW) and the Kroger. H-E-B Pantry of course was nice and homey, but it was Kroger that was the cooler, better one (even if it was older), and that was the anchor that was always there at Parkway Square, so I'd like to share a few words about it. It was a classic "Greenhouse" Kroger with "bauhaus" lettering if I recall correctly (there are lots of Flickr pictures related to that and what they mean), there was a red stripe running the perimeter of the store, the deli/bakery area (it was a small, combined department, and still is) had some seating near the entrance to the video department (more on that later), and the entrances and exits were very small and simple. One door in, one door out, operating by spring-loaded carpets. This was at the far right end of the store (that is, if you were looking at it from Texas Avenue). They had large arrows on them. But enough on Kroger for now, we'll discuss that red stripe and all in a second. 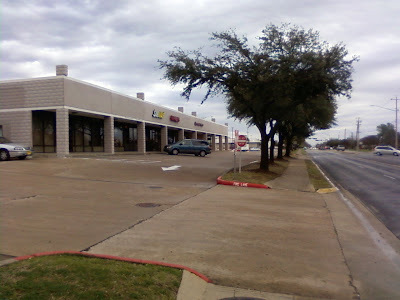 To maintain compatibility with the Texas Avenue directory I made, I'll have to start from the Firestone at the corner, which I'm not sure is actually part of the shopping center. 2400 - Firestone is on the corner at Brentwood and Texas Avenue. It renovated sometime in the mid-2000s or so, but about the time it happened, we had quit going there (it was once the "go-to" spot for car fixes for my family--until a management change). 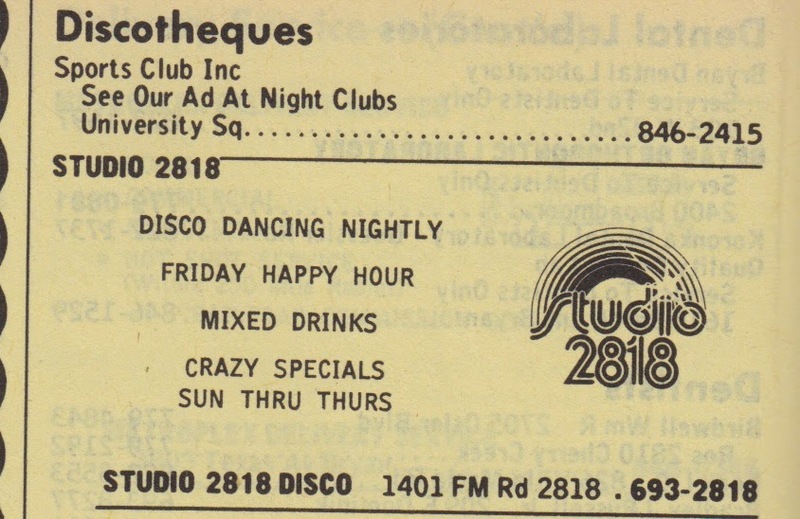 It appears it is the original tenant, as it was listed in the 1984 phone book. 2402D - The combined 2402 space (all tenants) is taken by "China King Buffet". This used to be Old Country Buffet, which I never liked, even before I stopped liking (and started hating) Golden Corral. I think it closed circa 2004, along with others in the state. 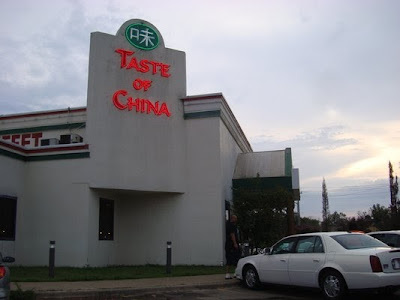 It later became China King Buffet by the mid-2000s, which I remember eating at once. 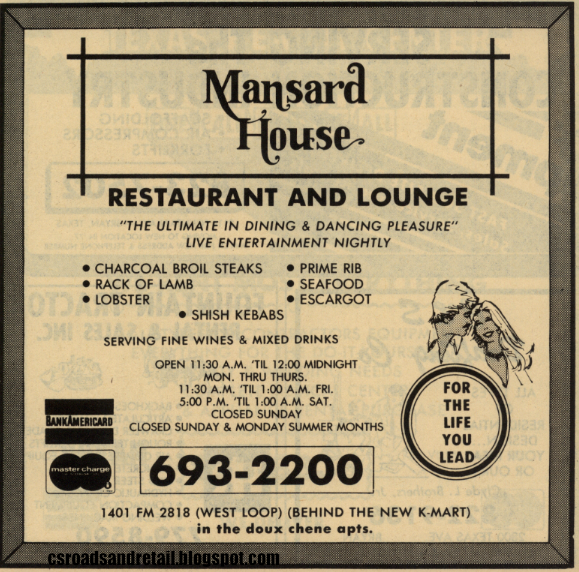 It was bland, and seemed overly large for the space, but I don't remember getting sick from it, which is probably why it has still stayed in business without any name changes (it did "renovate" once though). It remains open as of July 2016, though the recent renovation took away its distinctive "peak" shaped storefront from the OCB days. I might have a picture somewhere, I should add that in a future update. I actually think this was originally a Chinese restaurant originally...there was originally one "B B's Chinese Restaurant" in the early 1980s, though sharing the address of Firestone (which did exist at the time and was new) instead of its modern address, 2402-D.
2404 - RAC Rent-a-Center has been here for the last several years. 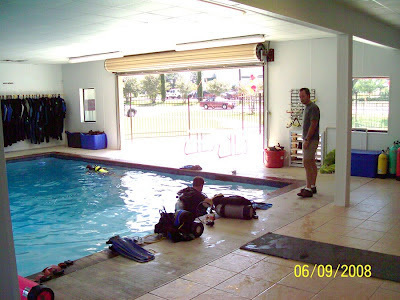 It absorbed old space from other retailers, like Paradise Scuba, which was located at 2404C prior to moving to the old Putt-Putt site in 2008. At 2404B, there was Champion Firearms, which moved out around 2003 when the new center with Hobby Lobby and Ross Dress for Less was built. 2406A - Resale & More is here and has been here since at least around 2009. I don't remember what was here before it. 2406B - Jackson Hewitt moved here after 2008, it used to be closer to the Southwest Parkway side. 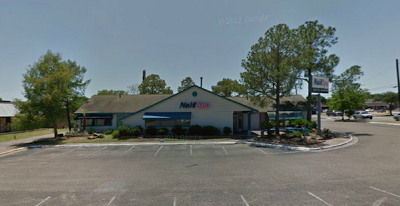 2406D - USA Nails I believe has been here for a long time, possibly changing its name from another nail salon. 2408 - The original 2408 (please ignore the typo on the official PDF) was a TG&Y Family Center. It was a larger version of the TG&Y five-and-tens (basically, a discount store, which almost every five-and-ten did). 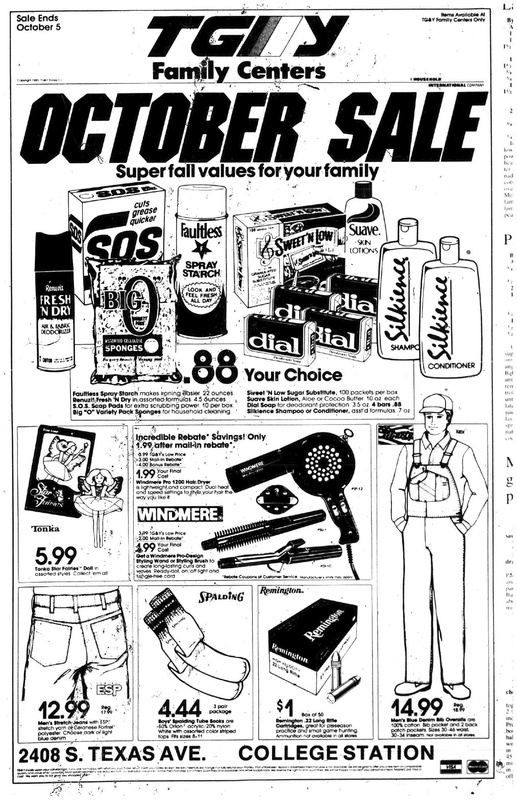 It's worth noting that the parent company of TG&Y sold out in October 1985 (same time as this ad), so I'm guessing TG&Y didn't last much longer here. After the closure of TG&Y, it (eventually) became Gold's Gym and a hobby store(?) called Amber's, and after Gold's moved in the early 2000s, it became Harbor Freight Tools and Dollar King, which both opened circa 2003-2004. Amber's would close around the late 1990s and become Stein Mart. Today, Harbor Freight takes 2408A, King Dollar next door takes 2408D, and Stein Mart takes 2408B. 2410 - Initially a location of "Chuck-E-Cheese Pizza Time Theatre", which was gone by 1989, with the area not getting another Chuck E. Cheese until the year 2005. That means, of course, that growing up, I never got to have any birthday parties at Chuck E. Cheese because it didn't exist in my town, but that also means I wasn't traumatized by any scary animatronics, the same ones that would be the inspiration for the cult-hit survival horror series Five Nights at Freddy's. (If you're reading this, I do plan on playing it when I get a new computer, and I'll make a review for it on Carbon-izer...despite its repulsive fanbase). After that it became one of the more intriguing concepts in the history of Kroger supermarkets that I've never seen anywhere else...an attached video store called Family Center Video, though admittedly the set-up was pretty useless. Because of the differences in elevation between Kroger and the video store, about three feet, there were stairs and a ramp (it may or may not have been ADA compliant, at least by today's standards), but the ramp was usually gated off, meant for those with disabilities and not for those with big shopping carts. I don't think I saw ANYONE actually transfer between the Kroger store and the video store, especially considering that it wasn't near any checkouts or entryways inside the Kroger. It probably would've been cheaper to demolish it and drop it to Kroger's level, which would let it be used for food and drug space, and perhaps ultimately save the store (see below). FCV disappeared pretty quickly after the arrival of Hastings (probably closing 1999), and the space sat empty until Half Price Books moved in around the early 2000s (2003/2004), and that was after the Kroger moved in. If you walked in HP Books near (ironically) the video section, you could notice a slight depression when you walked near the wall. In the original (carpeted) video store, there was a counter near that, in the far left end, plus a big metal "cage" in the middle of the FVC. This was where the kid's videos were, including Pink Panther shorts, Barney, and Bananas in Pajamas. The video store closed in the late 1990s (1998, 1999), perhaps because of the fact that you couldn't buy groceries at the video side, or vice versa, but the restrooms were kept into the Half Price Books era, and may still be there. The Half Price Books replaced it circa 2003/2004, and was there up until 2011. 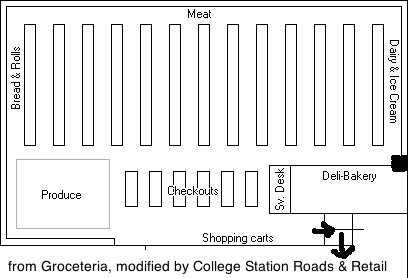 In 2012, it became "College Depot", which sells A&M branded stuff (always a popular choice) and items for dorms (a good idea, actually), and despite being a bit pricey, it ended up moving up to a slightly larger place when it took to half of the old Winn-Dixie/Lacks in mid-2014, and 2410 has been vacant space. This is looking straight through to the old entrance from the Kroger. Prior to the video store's closure, there was a small area with seating. 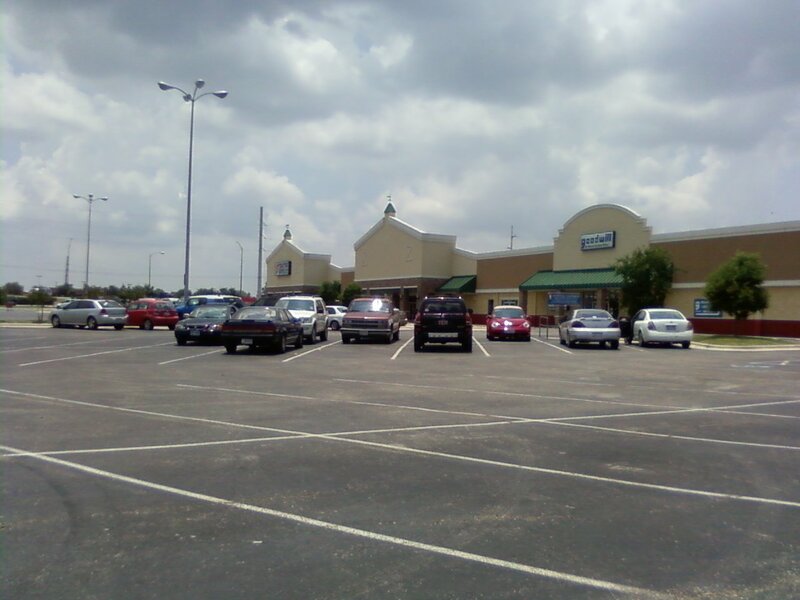 2412 - The biggest tenant of the plaza, Kroger, is just a bit over 46k square feet, which is far smaller than the H-E-B, though it was larger than the Pantry. In July 2016, it was announced that the Kroger would be closing forever in August. Seeing how it's the largest and one of the longest-lasting tenants in the center, let's talk about it a bit. The history of how this Kroger came to be is a bit murky, as it was a former "Greenhouse" store (image links for those who have no idea what that means) but was also known as "Kroger Family Center" through most of its life and had a store number (997) usually assigned to those were full-fledged Kroger Family Center stores, like the one in Bryan was . Originally a red stripe ran the perimeter of the store, which I loved as a kid. Notice in the hack job of a renovation they did, they didn't even bother getting identical tiles. One more thing I remember was that the milk area contained a lower ceiling and was tucked in a little corner of the store, forced down that way by the beer aisle (which, by the way, was once rumored to have sold more kegs than any other supermarket in the nation). Little plastic mock-ups of milk (and an orange juice) displayed prices. I've never seen anything like it since. The floorplan resembled, except for the aforementioned entrance to the video store, the "Superstore" design in terms of floorplan (and some other people on this page back that up). The Kroger was unofficially known as the "Kroger Family Center" even into the 2000s, even though they never had the Family Center merchandise mix, it was planned to be so, even gaining the store number that the Family Center stores had instead of the common early 1980s Greenhouse stores. I don't believe it was ever a Family Center, as it was built as a definite Greenhouse. This is where the original exits were. You had to go straight and then left out through tiny doors. Produce bags had nutrition facts printed on them (of fruits and vegetables), they had sample cookies, which were better than the store-bought pre-packaged stuff and did make shopping at Kroger a pleasure in my growing up years, and the bottom of the cart was spacious enough that even a 9-year-old kid could fit in there. Well, around 2001 or so, it renovated (very cheaply) to a then-contemporary décor package and rebuilt the facade so that there could be offices above the old "greenhouse" area, and pretty much meant that everything about the Kroger that was cool was gone, and it became just as dated as before and still not nearly as nice as the Kroger Signature to the south or the new H-E-B to the north. Were these tiles even touched? Gross! Most of my visits to Kroger post-renovation have been for convenience. I remember being mildly impressed post-renovation in early 2002, when my brother took me there to buy some dry ice, but it got dated and dirty VERY quickly, and most of my subsequent visits have been disappointments. It wasn't anything like the Rock Prairie Kroger or the H-E-B. The produce was sub-par (with a "little too ripe" smell), the international foods section was a disappointment (they put taco seasoning in this department), and generally everywhere else was slightly smelly and generally disappointing. When KBTX announced the closure in 2016, I was a bit surprised that it would come this soon but also had a twinge of sadness, as this was, after all, my childhood's Kroger (in August 2016 it closed permanently). For a brief time, the empty Kroger would come to look pretty rough, with graffiti on the windows, but it re-opened around June 2018 as another "Tru Fit Athletic Clubs". 2414 - To the left of the Kroger growing up was Roly Poly Rolled Sandwiches, which was in the Parkway Square of my youth (even if it opened in 1999, as I later found out, and not 1997). It lasted into the early 2000s with the sign and interior décor remaining up until the mid-2000s). I always thought it was a one-off, but it was actually a full franchise concept, because I remember it probably as early as 1997. 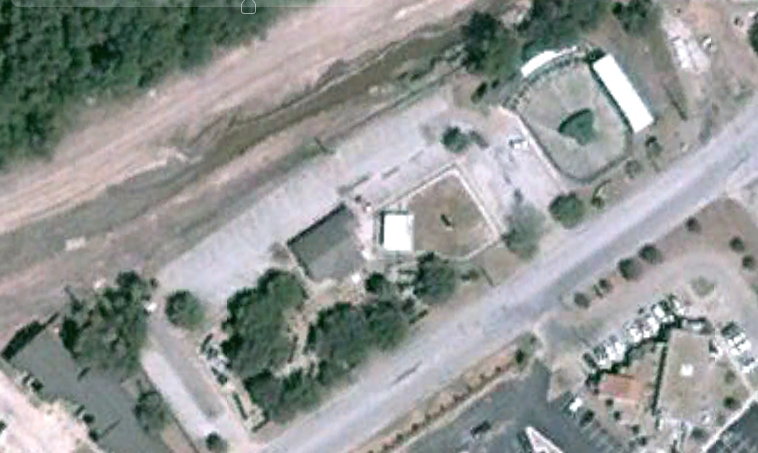 Roly Poly sat vacant for a while, then it became "Next Level Sports" circa 2008-2009 (mostly tennis), and after that BVMMA (Brazos Valley Mixed Martial Arts). I believe it's vacant again, after BVMMA moved to the mall a few years back. 2414A - Texas State Optical has been here for as long as I can remember, probably even as far back as 1996. I would have to pull out my directory scan to confirm that though. 2414B - Based on what I could find, it looks like TSO has absorbed this space, but originally this was The Cork Liquor Store (mid-1990s at least) and became Whiskey Charlie's in 2009 following a purchase of the local stores. Liquor stores usually did good business next to supermarkets as Texas law prohibits hard liquors and spirits on grocery store shelves, and every supermarket in town has a nearby liquor store that supplies the "harder stuff" you can't get at the store. For the College Station H-E-B, it's Spec's (even though it's a stoplight down), for the Tejas Center H-E-B it's Libations, for the Tower Point H-E-B, it's Whiskey Charlie's #3, and both College Station Albertsons had Western Beverages nearby, as does the Bryan Kroger. The Rock Prairie Kroger likewise has a nearby Spec's (formerly JJ's). The closure of Whiskey Charlie's in about 2012-2013 should've been a red flag that the Kroger wasn't going to make it. 2416A - Like China King, this space (a restaurant) takes up the 2416 space as well. Honey-B Ham & Deli (not to be confused with "Honeybaked Ham", a chain) was here for a long time. In late June 2009 it closed and was replaced with Taz (though not immediately), an Indian restaurant/buffet. I finally ate there in 2015 (and the first time I had goat in well over a decade), ate too much bread, and saw some bizarre (some would say paranormal) incident where a bowl of yogurt sauce managed to slide in a curving, non-friction way toward me even though the table wasn't slippery or leaning in that direction. 2416B - Advance America Cash Advance is next, and that used to be a Christian bookstore in the late 1990s and early 2000s, though results are turning up for a Pack & Mail. Maybe it was Smoothie King that the bookstore was in. 2416C - Smoothie King was here in the early to mid 2000s before moving to near the College Station H-E-B. Later on, it became My Party Palace (I believe around 2007-ish, since the chain was founded in 2005). It was part of a chain out of the Austin area to do princess-themed party planning for young girls, but it ran headlong into the recession, and all eight other locations closed. 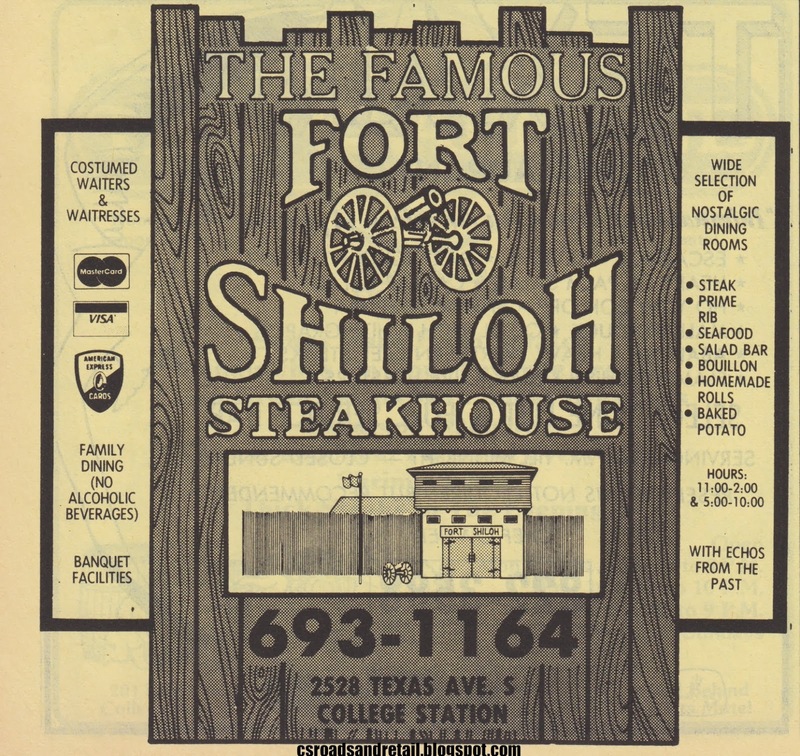 The College Station location was the last to close, closing in December 2014. The space is still vacant. 2418 - On the corner sat the Baskin-Robbins. 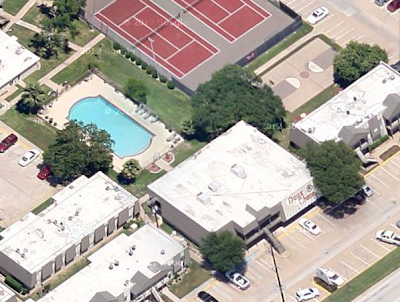 It faced both the main parking lot and Southwest Parkway and had doors to both. Featuring "thirty-one-derful flavors", this was my favorite ice cream parlor for years. I had fond memories of this place. Anyway, Baskin-Robbins became "KaleidoScoops" around 1999 (though I swear it was a year or so later), the "32 Degrees: The Ice Cream Club", then just "32 Degrees" until it closed entirely, which was maybe 2004-2006 (by this time Cold Stone had opened up). Later on this was replaced with Corner Cuts, as it was the corner and they did do haircuts...but later they changed names to Classic Cuts (in spring 2016). 2418B - Then there's Gomez Shoe Repair (originally Cobblestone Quality Shoe Repair, I vaguely remember when they changed the name, but I forgot when). I can't find a 2418A either, probably because where 2418A would be is just a wall. Despite what the leasing plan says, I'm pretty sure that whatever was before Advance America (possibly dating back to the first tenant) used the space there and walled it off. 2418C - This has been more or less vacant for a while, between late 2009 (when they signed the lease) and 2011 (when they were locked out), this was Moosegus. I believe this used to be the original Subway (see Subway's entry further down). In the previous version of this, I claimed they never opened. I was wrong, they did! It was a skateboard/wakeboard/snowboard store. The immediate problem with that it was for a market that didn't exist. At the time it opened (late 2009/early 2010), the skateboard park there on Rock Prairie didn't exist, the wakeboard park off of Deacon didn't exist (and still really isn't open yet in many aspects as of this writing), and snowboarding? Well...you know the answer. 2418D2 - This was Farmers Insurance, which I think was the old Jackson Hewitt. The latter was intact in 2008, and had opened several years prior to that, but by 2008 the sign was rather faded. It remains vacant today. 2418D - This Subway store the first Subway in the state of Texas, sort of. By sort of, I mean, it was originally on this side of the shopping center but at some point in the mid-2000s (after a logo change but before 2007), it switched from just a few spaces down. It's store #628 (the others have numbers in the thousands), and although it switched slots in the shopping center, the first Subway in Texas is in the shopping center on Southwest Parkway. 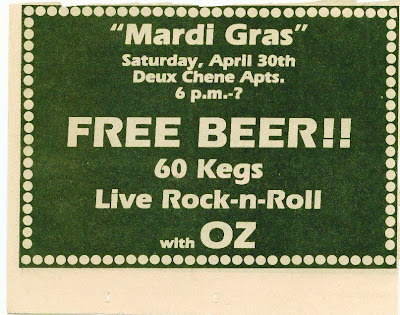 I learned that when applying for a job at a local Subway (as Centex Subway did a group interview...and my old early 1980s phone books later confirmed) and although I ultimately didn't get the job, it was still a really neat piece of information. I seem to remember a store called "Beepers" (or at least the facade being called such) being around here until around 2000. 2418F - For many years, this was FabricCare Cleaners. It had a drive-through window, but it moved in the mid-2000s, and became Tobacco Junction, which utilized the drive-through but closed after less than a few years. The awning was removed and I believe this has been vacant since. Besides the Kroger fuel station which opened a few years after the remodel (maybe 2005), the only other thing worth noting is the McDonald's, which is technically not part of the center. 2420 - Based on the fact that McDonald's ads in the October 1985 paper list the only two stores at the time (University Drive and Villa Maria, both of which were torn down and rebuilt about a decade ago), but a 1984 phone book did show this store being built and open, suggesting that it was opened around the same time of the Kroger shopping center after all). It had an extremely cramped and strange ramp orientation regarding the drive-through, so when the McDonald's was completely rebuilt around 2005-2006, the playground was removed to alleviate this situation. The playground was the worst: it wasn't much more than a wooden structure resembling a spaceship. You climbed up, looked out...and that was all. My brother claimed it replaced a much cooler and better playground. When it was rebuilt, there wasn't a playground at all, just a couple of Nintendo GameCubes with things like Mario Kart. Within a year or so, the controllers (they had been fixed in with metal) were so dirty and worn out. The control stick, for instance, looked like it had been chewed off. The sign is fairly unique as well--it was originally a full McDonald's sign, but it was destroyed by a windstorm circa 2009-2010. It either had gotten grandfathered in from new sign ordinances and couldn't rebuild, or maybe McDonald's was just cheap--but they removed the damaged golden arches entirely and replaced the "McDonald's Restaurant" sign with a new simple "M". In 2018, the restaurant was renovated to be another casualty of McDonald's quest to get rid of mansard roof restaurants, even newer ones. (It doesn't look like the picture anymore). Note the fake owls mounted on the roof to scare off birds that roost on the stoplights at certain times of the year. This photo makes the area surrounding it seem leafy and green. 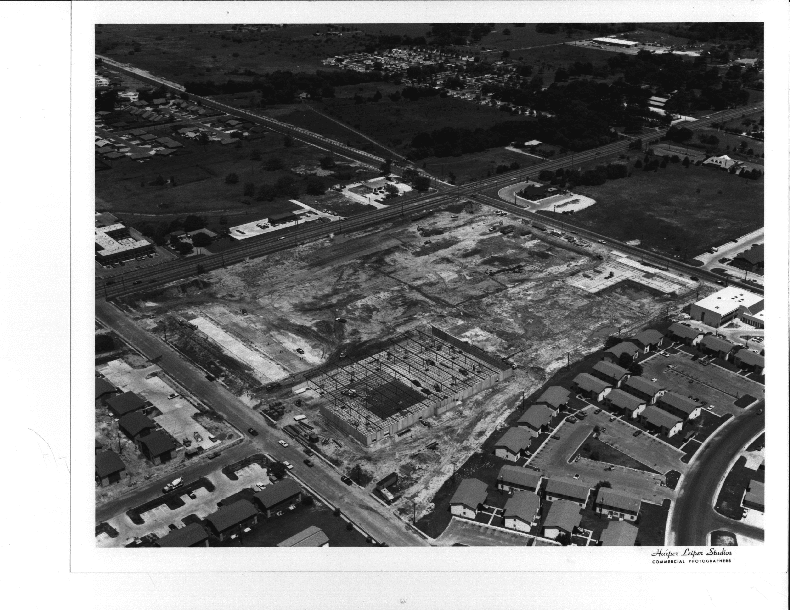 Not entirely trickery, a large tree was once adjacent to the McDonald's, torn down for widening of Texas Avenue. The butchered sign is in the background. So that's my story of one of the most nostalgic -to me- shopping centers in this area, as this stretch tended to be my stomping grounds growing up. I hope you enjoyed it. This post featured extensive updates in July of 2015 and July of 2016. In April 2019 some new additions were made.